Tomb frescoes from Paestum (350 BC) show paired-fighters in a propitiatory funeral blood-rite that anticipates early Roman gladiator games. Livy dates the first Roman games to 264 BC, during the First Punic War against Carthage, when Decimus Brutus had three pairs fight to the death in Rome's Forum Boarium (cattle market) to honor his dead father as a Munus (a commemorative duty owed to the Manes (spirits) of a dead ancestor). 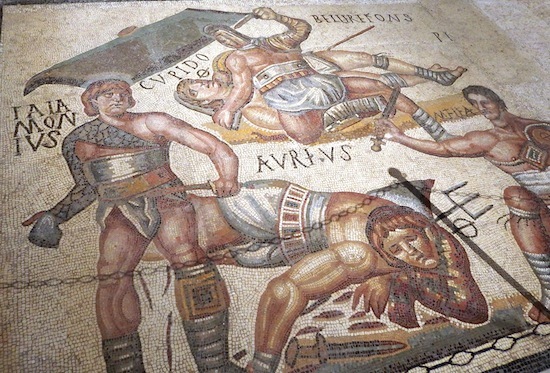 In 216 BC, Aemilius Lepidus was honoured by his sons with three days of gladiatora munera in the Forum Romanum, using 22 pairs of gladiators. 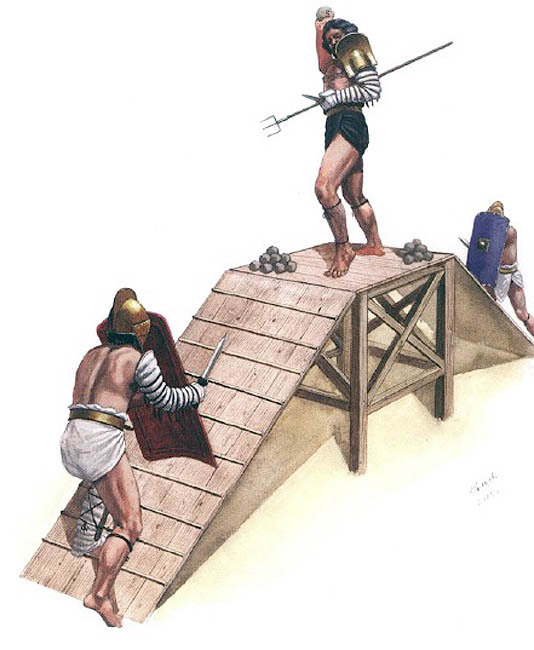 Samnium's support of Hannibal saw the Samnite-style gladiator became popular at Roman banquets to celebrate the victory over their defeated foe. As Roman conquests continued thay added more gladiator types such as the Greek hoplomachus, Thracian Thraex, and the Gaul. Munus, or Munificence, gladiator games could celebrate military victory or the religious expiation of military disaster in order to help lift Roman morale. 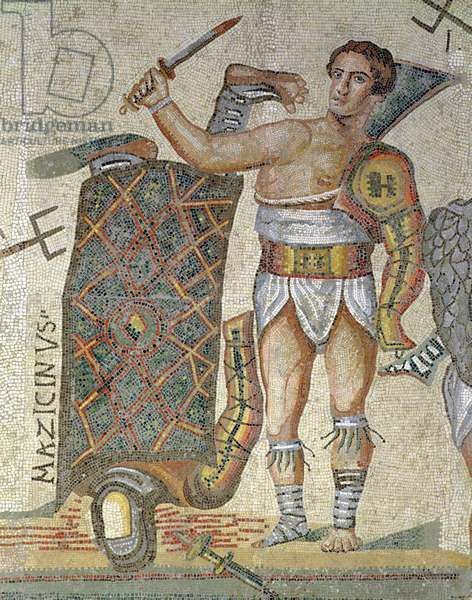 In 183 BC, three days of funeral games for Publius Licinius included 120 gladiators and a public feast. By 174 BC, small Roman munera provided by local editors had become common. In 105 BC, the ruling consuls provided state-sponsored "barbarian combat" demonstrated by gladiators from Capua, as part of a training program for the military that proved immensely popular. Sponsoring Gladiator games as free public entertainment became a prime way for senators running for public office to win votes. In 65 BC, Julius Caesar tried to sponsor huge games, but the alarmed senate passed a law limiting the total number of fighters he was allowed in Rome to 320 matched-pairs. Roman conquests continued to provide a huge supply of slaves to be trained as gladiators, and these were supplemented by free-men volunteers that fought to earn money and glory. Augustus officially regulated the gladiator fights as ludi (state games) dedicated to deities such as Jupiter or the Emperor throughout the empire with the widespread construction of amphitheaters. Claudius made town magistrates personally fund the games in their local communities. In Rome this public entertainment ran for a good part of the year, that along with the free corn-dole became the "Bread and Circuses" keeping Rome's rowdy lower-class population content. Extravagant entertainment included wild beast shows, criminal executions, novelty acts (including dwarfs and left-handed fighters), historical and mythical re-enactments, and even flooding the arena to provide sea battles. Several Roman emperors, including Caligula, Caracalla and Commodus fought in the arena as gladiators. Juvenal records an aristocrat (a descendant of the noble Gracchi) infamous for his marriage (as a bride) to a male horn-player, making a voluntary "shameless" arena appearance not only as a lowly retiarius tunicatus but in woman's attire and a conical hat adorned with gold ribbon. In 108 AD, Trajan celebrated his Dacian victories using 10,000 gladiators (and 11,000 animals) over 123 days. Constantine banned the games in 325 AD as inimical to Christianity, and ordered that the criminals condemned to die as gladiators should instead be sent to the mines - but soon resumed the games. However their reduced popularity can be seen in a calendar of 354 AD that lists 176 days reserved for spectacles including 102 days for theatrical shows, 64 for chariot races and just 10 in December for gladiator games. But the games never really lost their popularity and persisted until the very end of empire in 476 AD. Spartacus (109 - 71 BC) was a Thracian prisoner of war, who served in the Roman army, became a thief, and was sold to lanista Lentulus Batiatus, a trainer of a gladiatorial school. After training to be a gladiator, Spartacus escaped and started a massive rebellion against the Roman empire, creating an army with over 70,000 men. Emperor Commodus (117 - 192 AD) fought as a secutor, and boasted of winning over a thousand matches. He had all the public notices inscribed with the records of his appearances in the games, but most of these matches were rigged, and he would usually fight opponents who were weak, or had poor weapons. Flamma was a Syrian slave who became an exceedingly popular secutor, and was awarded with a rudis (small wooden sword) four times during his career, for his impressive fighting skills, which enabled him to take early retirement as a free man. However, he refused his freedom on all four occasions, and chose to continue fighting as a gladiator for the rest of his life. His gravestone states his record to be an impressive 21 wins from 34 matches, of which 9 were draws, and only 4 were defeats. Despite his awesome record, he was killed at a young age of 30, due to the risky nature of the sport. 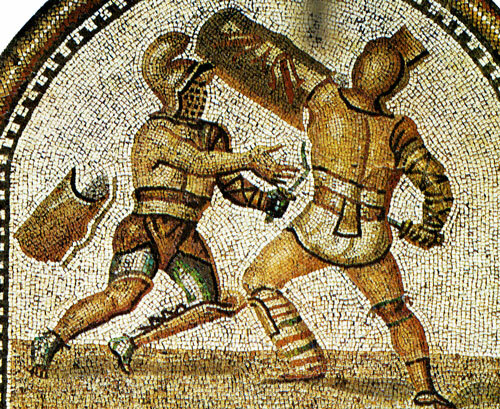 Priscus and Verus were two gladiatorial rivals so evenly matched, that their fight lasted for hours. Eventually, both of them conceded their defeat to each other. Seeing their amazing skill and spirit, the roman emperor Titus awarded them with the rudis, and these slave fighters walked out of the arena as free men. Spiculus was a gladiator on very good terms with emperor Nero, during his reign. In fact, he won himself vast amounts of land, slaves, and other prizes from the emperor, for his fighting skills. When the emperor was overthrown in 68 AD, he wanted Spiculus to kill him, but after being unable to find the gladiator, emperor Nero committed suicide. Crixus was the right-hand man of Spartacus, known as 'The Undefeated Gaul'. When he was eventually killed in 72 BC, Spartacus sacrificed 300 captives to honor Crixus' name. 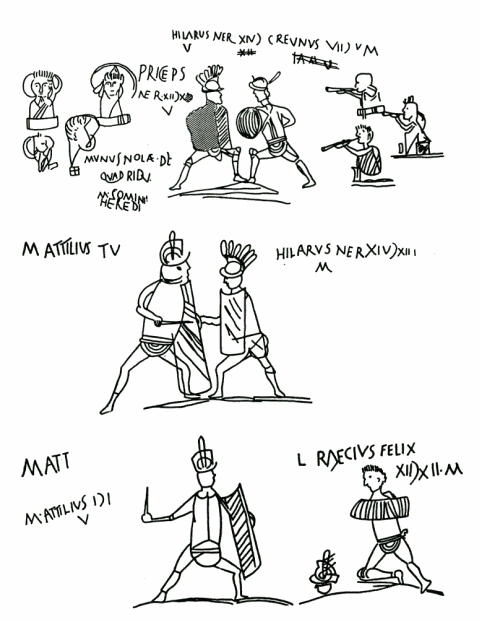 Tetraites was a very famous murmillo fighter known all across the roman empire. Archaeologists found graffiti depicting his victories in the ruins of Pompeii, and pottery showing his triumphs in regions as far as modern-day England and France. Carpophorus was a bestiarii, known for fighting many wild animals at the same time. He is remembered for defeating a leopard, bear, lion, and rhinoceros at the same time in one battle, and a total of 20 animals in the same day during the opening of the Flavian amphitheater, which led to him being compared to the Roman demigod Hercules. Hermes is mentioned in a few poems of Martial stating he was an exceptionally skilled fighter with the strength of three men, adept at using all kinds of weapons, and known to bring fear into any foe.